A drive along the Mosel River gets you into a quiet, romantic corner of Germany. There are different ways to see this river... tours and river cruises. We drove, so we'll tell you about that. We recommend that after a day or so, you leave Frankfurt behind, and see the castles of the Rhine. You're ready to round the corner to the Mosel River. This area sprinkles smaller castles among romantic, peaceful villages and hillsides covered with vineyards. If you approach it from the Rhine you will start near Koblenz. 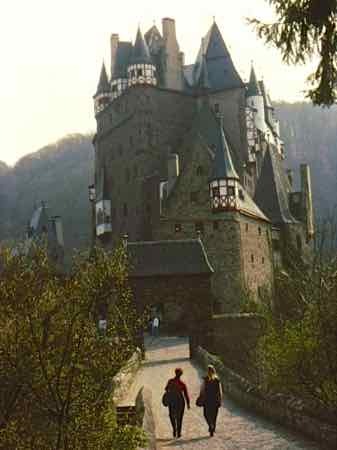 One of your first treats will be to get off into the mountains to see Burg Eltz (Eltz Castle). Burg Eltz is about an hour from the Rhine River. It's between Koblenz and the Mosel town of Cochem. Your drive will take you off the main road and wind up a narrow road to a parking lot. From there take a shuttle or walk to the castle. It has been left intact for 700 years, never having been destroyed. It is furnished as it was in the Middle Ages and is still owned by the Eltz family. A tour of the castle takes about 45 minutes and is well worth it. There are English as well as German tours. How Often Can We Say Cute Little Towns? This is the first little town of size that you come to as you drive south. Cochem is a picturesque town and a tourist hub. You can easily find hotels, B&Bs (Zimmers in German) and restaurants. The old quarter is dominated by its 1000 year old castle, which can be toured. The town itself is dotted with restored timber framed houses. Beilstein is one of the quaintest of all Mosel River towns. It has narrow lanes and yet another ruined castle. Along the river, you're sure to see swans... be sure not to invade their territory; they will probably try to chase you off. Zell is a peaceful town with a fine riverside promenade. It has plenty of wine bars, restaurants and Zimmers. And got the photo, so we include it as another town on your drive south. The town of Bernkastel is over 700 years old. It is on the middle Mosel. In a valley full of wine towns, this little village stands out. 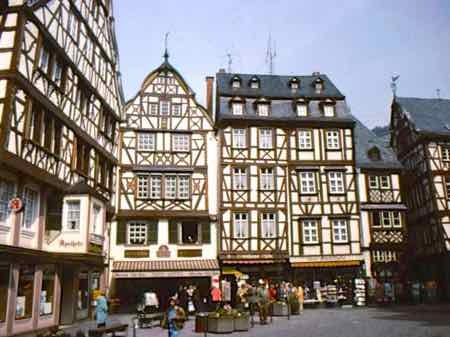 Half-timbered buildings dating from the early 17th century surround its old Marktplatz. It is 30 miles (48 km) from Trier. 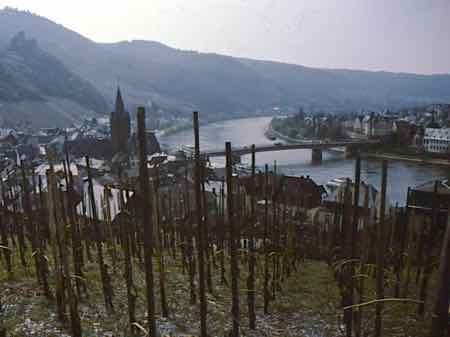 The legendary (among wine aficionados) Bernkasteler Doctor Vineyard is located along the Mosel above the town of Bernkastel. It is one of Germany's most famous and expensive wines. This part of Germany is known for it's Rieslings, but there are other wines available. 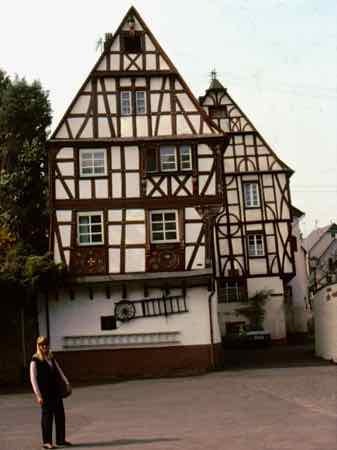 There are small hotels in most of the towns, but this is a great area to just look for one of those "Zimmer Frei" signs and stay with a family. Pick the right place, and they might even make their own wine.... and let you sample it. They'll feed you a great German breakfast and give you tips on where to have lunch and dinner. You may have a quiet balcony to sit on and look at the swans float by on the river... and really unwind, which is what a holiday is all about..., isn't it? Quaint, Picturesque, Cute - Too Much? If you're getting the idea that all the little towns and villages along the Mosel River are quaint and picturesque... you're absolutely right. And enjoy. You'll be using all those superlatives too.